GPSTrak can be turned on or off from the add or edit employee screen using the "Enable GPSTrak location updates while clocked in via mobile" checkbox. By default, this option is not enabled. NOTE: Enabling GPSTrak does not continuously track GPS locations because the battery drain on a smartphone would be significant. Rather, GPSTrak takes a few location updates an hour, which does consume more battery power than if the feature was disabled, but nowhere near as much as it would to perform continuous tracking. 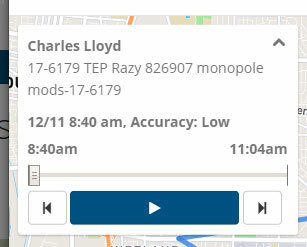 GPSTrak locations can be viewed from the "View Time Sheets" screen in the web dashboard. Select a time record for any employee who has GPSTrak enabled to view their time sheet. To view the GPSTrak Locations, click on the compass icon next to the time segment you want to see locations for. If there is no compass icon, then there are no GPSTrak locations. Check to make sure the feature is enabled for this employee. Clicking on the compass icon will bring up the GPSTrak window. The GPSTrak window consists of a map with the location pins on it and controls in the top left corner. Clicking on any of the pins will show you the details of that location including the time it was taken and the then active job and task. 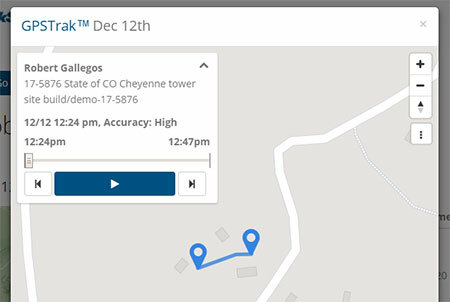 Selected pins will also have a circle around it that shows the accuracy level of that particular location as reported by the GPS sensor on the mobile device. The actual location of the device could have been anywhere inside of that circle. The smaller the circle, the more accurate the GPS reading was.